Men are definitely becoming more interested in natural health and wellbeing in recent years and this is something that we have noticed at our store. We are finding that more male customers are reading up about the latest products for men’s health and will ask us to source particular items. We stock a wide range of whole foods, such as nuts and seeds and deluxe muesli, and we find that they are particularly popular with the men who visit our shop. Pumpkin seeds are rich in zinc, which is an important mineral for men’s health, and a lot of our male customers have read about that. It’s a great nutritional power house and a good healthy snack. We find that one of the most common men’s health issues is prostate health. BPH or Benign Prostatic Hypertrophy is when the prostate becomes enlarged and is a condition which tends to affect men over the age of 50. If a customer asked us for advice about this we would be able to suggest certain natural products that they might like to consider, but we would always advise them to see their doctor first in order to get a proper diagnosis. Saw Palmetto is a herbal product which is traditionally used to help with an enlarged prostate gland so this is something that men who want to take a natural approach to their health might want to try. Other products that are popular with our male customers, particularly the sporty types, include the protein powders and protein bars. As we are based in the countryside we get a lot of cyclists who are looking for a natural source of energy to keep them going. The Pulsin’ range of protein powders made from vegetable sources such as pea and hemp are particularly popular among the men who own a Nutribullet and like to make their own smoothies. The protein bars are a handy snack to take when they are out exercising. We stock a specific men’s multivitamin from Solgar which is good for men who are just looking to maintain their overall health and wellbeing. Customers who are looking for more specific advice about certain health issues can speak to our member of staff who is also nutritionist. Lastly, we also stock a range of natural and organic toiletries for men which includes shower gels, shampoos, shaving creams and oils. We have noticed a definite increase in the variety of chemical-free male grooming products available now, although I think the ladies tend to buy these products more for their husbands or partners! We are always on hand to help all our customers and offer advice on their product choices. If you need any help with a particular health issue then we are more than pleased to assist. The store is celebrating its 40th anniversary this year. Maggie and her husband Eric first set up the business in 1976 when it started out as a market stall selling a small selection of wholefoods. Such was its popularity that the couple opened up Spill the Beans in Wimborne in 1977 followed by a second store called Purbeck Wholefoods, in Wareham, a year later. 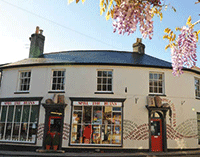 The shop stocks a wide range of quality produce and organic food and has an extensive free from section as well as a wide range of supplements and herbal remedies. Spill the Beans is very much a family business with three generations of the Drennan family involved in the running of the store, aided by an experienced team of staff members, some of whom have worked for the store for over 20 years.